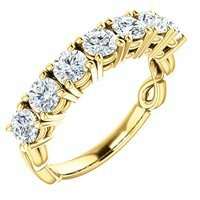 No doubt that the most exquisite way to represent your undying love for each other is to purchase a diamond eternity band from WeddingBands.com. 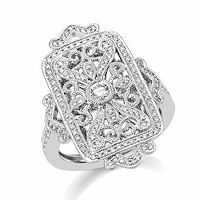 Whether you want a traditional round eternity diamond band or the one featuring fancy cut diamonds of your choice, we guarantee the finest quality ring at the best price. View our fine selection of eternity bands made from 14 karat yellow and white gold. Hand-matched diamonds with maximum brilliance set in 18K gold to make the perfect eternity band. 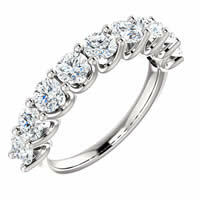 Desirable collection of platinum eternity bands to celebrate your occasion. 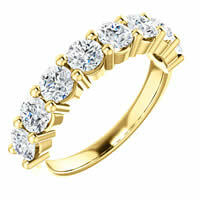 Fine selection of eternity bands made from 14K two-tone and tri-color gold. Desirable collection of palladium eternity bands to celebrate your occasion. Each of our eternity rings are graded at Very Slightly included in clarity and G/H in color or better. Our diamonds are always better grades for the same price or better than the leading bridal website. 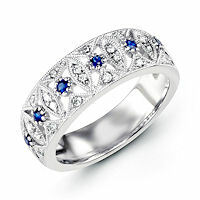 Our eternity rings start at $1,000 and increase from there. The sky is the limit, and if you do not see what you are looking for, we can always make a custom ring. Just call or email us and talk to a GIA certified jewelry professional. If you have any further questions about our eternity rings please call us at (888) 422-4333 or email us at CustomerService@WeddingBands.com to speak to one of our many expert jewelers on staff. Like us on Facebook at Facebook.com/weddingbandscom or follow us on Twitter@weddingbandscom.